Pianist-singer Wendy Kirkland is consolidating her status as a force in British jazz, especially in the sector populated by “piano divas”, the title of the hugely popular début album which her quartet has been touring countrywide and still is. That she’s also working on a second, due out in June and including original work, demonstrates that she’s operating at full creative tilt. Piano Divas (2017) was a trawl of compositions associated with other female jazz musicians but without any hint of simulacrum. It was a way of bringing jazz piano-playing and jazz singing to bear on charts that ranged from the Jimmy van Heusen/Sammy Cahn tune “Come Dance With Me” to Ben Sidran’s “Be Nice” and included one original by her and one by her and her husband, guitarist Pat Sprakes. Dave Gelly in The Observer called the album “a very classy début”. Kirkland insists on being called a pianist-singer rather than a singer-pianist because she’s a pianist “first and foremost”, just like the divas commemorated on the album. Sprakes, bassist Paul Jefferies, and drummer Steve Wyndham make up the rest of the quartet. Piano Divas was Sprakes’s idea. Kirkland’s influences are legion, but include Chick Corea, Richard Tee, Kurt Elling, Kenny Rankin, Dianne Reeves and pianist-singers Eliane Elias, Dena Derose, Carol Welsman and Shirley Horn. Her watchword is “emulation”, not “imitation”. “I loved all the artists we were planning on celebrating, and was very excited by the prospect of putting my own stamp on it”, she said. “It also gave me an opportunity to work with Pat on guitar, rather than on double bass, which is the more usual arrangement; guitar is his first instrument. The reception to the album on tour has been wonderful and enlightening. The comments from promoters and audience members alike have been overwhelmingly positive. Over the course of the tour, the band developed a flow and togetherness only achievable from a fairly long run of gigs. And it has been a long run: 30 dates between March and December last year and continuing this year. We have gigs booked till July”. It’s a wonder she has time for anything else, including running the Chesterfield Jazz Club with her husband. They started it to extend their own careers and set up a Ronnie Scott-style performing space, with a house band. “I think it’s been a massive help”, she explained. “Although I occasionally get my arm twisted, the majority of the gigs at the club feature me, Pat and drummer Clive Loveday. I’d say it’s certainly boosted my confidence as a player, band leader and host, as it’s a great success and has been running now for almost seven years. I’ve made some great friends, both among visiting musicians and regular audience members, and I’ve really widened my musical network. “I think our club is the only modern jazz club in the region with no funding other than ticket sales. As is usually the case, the UK’s independent clubs are run by volunteers, such as ourselves, with minimal resources; we do it for love of the music and the desire to sustain and develop a jazz audience”. “I’d been playing through transcriptions of Dave Brubeck and Harry Stoneham compositions and solos, because my dad had the books. I was about 14 and really preferred the sound of jazz harmonies to those in most classical pieces I was playing – to me a much more sophisticated and intriguing sound. “By the age of 19, I was playing for dance classes and in pubs and clubs myself and wanted to learn jazz; at the time I didn’t know of anyone in the area available to teach me. I bought an Oscar Peterson album but couldn’t slow the record player down, and therefore I had only limited success in aurally transcribing and playing his lightning runs! It was only much later that I got my hands on a player that could slow down and loop”. While working as a trainee engineer she was in two bands, one as a guitarist – she learned to play the instrument in order to join – but always wanted to be in a jazz band. Then she met a drummer who also wanted to, and although they were both playing in a 1970s disco band they decided to set up the Wendy Kirkland Trio. “I wasn’t singing jazz at this point, only playing piano”, she said. I eventually left full-time employment to become a freelance musician, because I couldn’t continue burning the candle at both ends. It took me a long time to come to terms with it, having had a day-to-day working mentality and taking a massive pay drop when I left my well-paid job with car, laptop, mobile phone, etc., in 1996. It was only when I met Pat and we got together that I regarded myself as primarily a musician. He made me realise that it was OK to be that way. This might sound odd to some, but I almost felt guilty – selfish – that I wanted to prioritise my music”. Then she was in a duo with a guitarist who was a fan of Diana Krall and Blossom Dearie. He suggested that maybe in the whole of the UK there was a gap for a Krall-type musician. He meant a pianist-singer rather than a singer who accompanied herself. She decided to try it. She was already singing in a choir with her mother and two sisters. But jazz singing meant using the chest voice more than the head, and tackling the sort of piano voicings to comp and lock in with the other members of the band. “I saw it as an expansion of focus as I have developed the simultaneous vocal doubling of my piano solos, which I don’t learn, so I have to be at the same time spontaneous and accurate with my singing of the intervals I’m playing. It’s tough but very effective, and it also adds another timbre to the music”. Kirkland certainly knows her own mind. And she’s outspoken about women in music. “What the hell does my gender have to do with the instrument I play?” she asked. “Like it’s a different job from a pianist’s, the implication being that you have to be male to do it. All you can do is just get on with it. You might convince a few people to change their minds but there will always be those who just won’t. “I saw some shocking statistics about how many female instrumentalists had undertaken a jazz degree over the last 20 years at one of the top institutions in the UK – it was pitiful. Also, and perhaps worse, the number of applicants is appallingly low. I don’t think it’s a surprise when young women have so little inspiration. Where do you see female musicians on television? It’s nearly always bands of male players with a few female singers on virtually all of the programmes. Then, to make matters worse, we get images of all-female pit bands on the front of music-industry magazines, like it’s a groovy novelty, which only serves to reinforce the stereotype”. She said the bewildering array of styles in today’s jazz was inspirational and challenging. Musicians who might appear outside jazz’s boundaries might be just those who will draw in peripheral listeners. “We jazz musicians have lost count of the times we’ve heard listeners say they don’t usually like jazz but they liked some chart or other”, she said. “People don’t know what jazz really is. And what is it? It’s such a broad church. I defy any listener to not like at least one piece that I’d call jazz. Jazz must contain at least some spontaneous material, even on recordings, rather than just a cynical emulation of another player or singer’s style. There are an awful lot of soundalikes around and I find that wearisome. “There’s far too much emphasis on wanting to be a star and being ‘different’ rather than striving to hone skills and craft. Musicians are expected to be churned out by academies in a fully-formed state, neglecting the fact that the ones who created the art form in the first place took time to develop and in many cases were far from perfect technically to begin with. It’s the ‘jazz idol’ mentality. I quickly get bored with any song or any musician I immediately like. The ones who take a bit of time to ‘get into’ stay with me for a long time. I think that could be because I’m subconsciously detecting a shallow appeal, something meant to dazzle, not smoulder, rather than something with integrity that will develop and reveal new layers”. 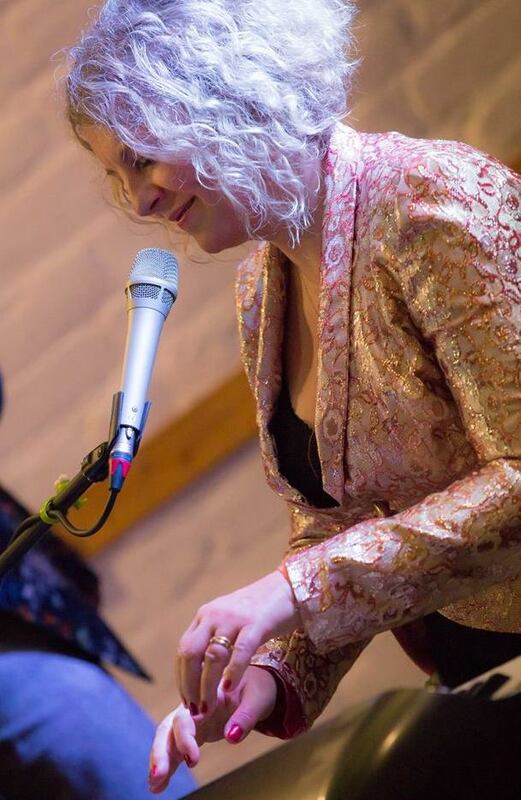 Wendy Kirkland plays The Stables, Milton Keynes (2 April), Karamel, Wood Green, London (4 April), Derby Cathedral (27 April), Huddersfield Jazz (19 May) and many more dates in 2019 with her Piano Divas show. More details at wendykirkland.com.